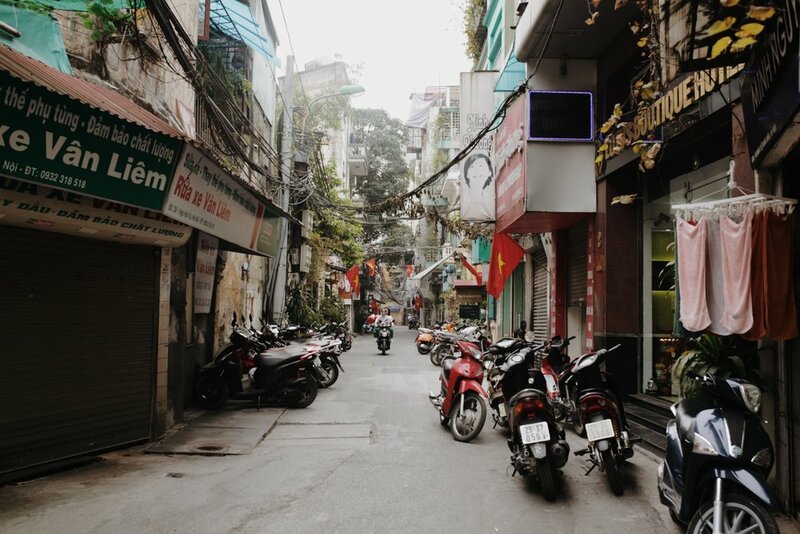 When my dad and I decided to go visit my sister who was living in Thailand, we almost immediately decided that we would add on a stop in Vietnam. He had been interested in visiting the country for a while and I honestly didn't know too much about it, but it looked beautiful and the more adventures the better! If we were going all that way, why not try to see as much as possible? Since the main goal of our trip was to spend time with my sister in Thailand, we decided to spend just five days in Vietnam. We would fly into Hanoi and take a couple of side trips from there. It turned out to be a fantastic decision and I honestly can't believe how much we saw in such a short time! If you are traveling to Southeast Asia and have a little bit of time to spare, I highly recommend a stop in Hanoi. 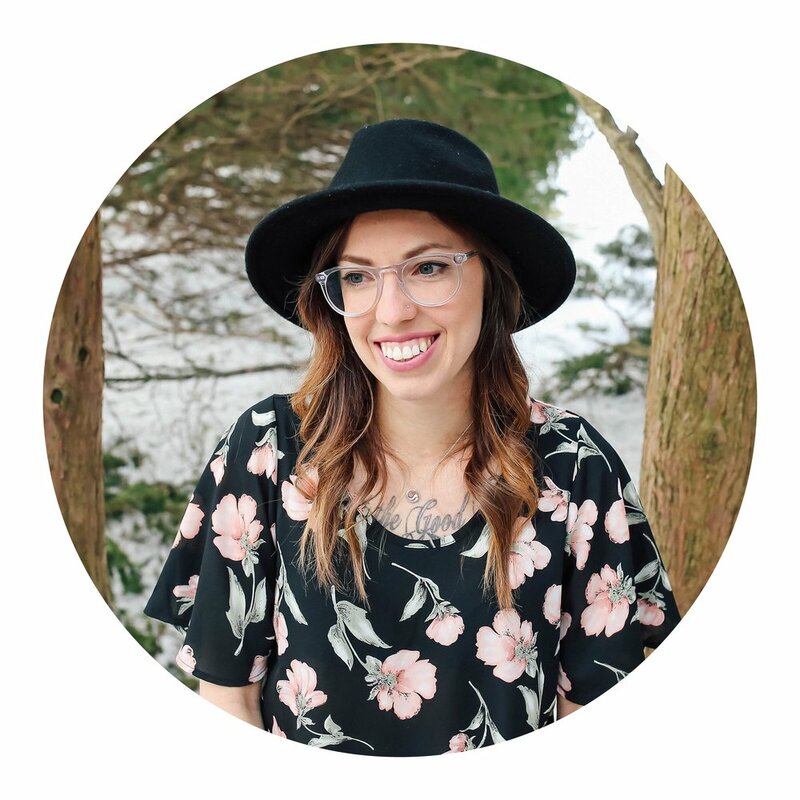 I am going to share our jam-packed five-day itinerary with you. Firstly, though, a bit about the planning process: I found our hotel in Hanoi first; I liked it for its location as well as the fact that it had add-on options for day trips and tours. 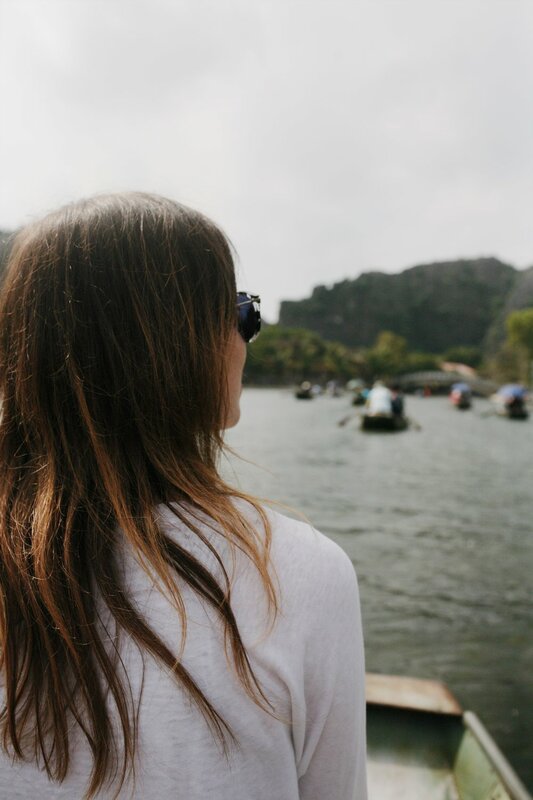 We decided to add on an overnight stay on a boat in Ha Long Bay and a day trip to the mountains of Ninh Binh. Since both additions (including transportation) were reserved through the hotel, the booking process was streamlined and simple. They also shuttled us to and from the airport. Alright, now onto the trip. We hopped in the hotel shuttle and rode from the airport, through the fields, over the river, and into the city of Hanoi. We were in Vietnam! Despite the near 24 hours of travel, it was incredibly exciting to be in Asia for the first time. We reached the Old Quarter, where our hotel was, got checked in, cleaned up, and headed out to explore the surrounding blocks on foot. Busy open-air restaurants with colorful miniature stools and tiny tables line the streets. Between them, coffee shops and stores of all kinds. The streets are full of the most insane traffic I've ever witnessed; stop signs are meaningless, motorcycles and scooters are extremely abundant and weave between cars and people. Crossing the street is an act of confidence - you have no choice but to step out into the constant stream and hope that the next vehicle will slow enough for you to get across safely. Walking through Hanoi is a shocking, overwhelming sensory overload, but in the best possible way. After a much-needed night of sleep, we headed out again into the city. This time, we ventured a bit further. We walked to Hoan Kiem Lake (translates epically as Lake of the Returned Sword) in the historical center and main downtown area of the city. There is a beautiful, park-like path that entirely encircles the lake. From the northern shore stretches a long red bridge that leads to Temple of the Jade Mountain that sits on an island in the middle of the lake. 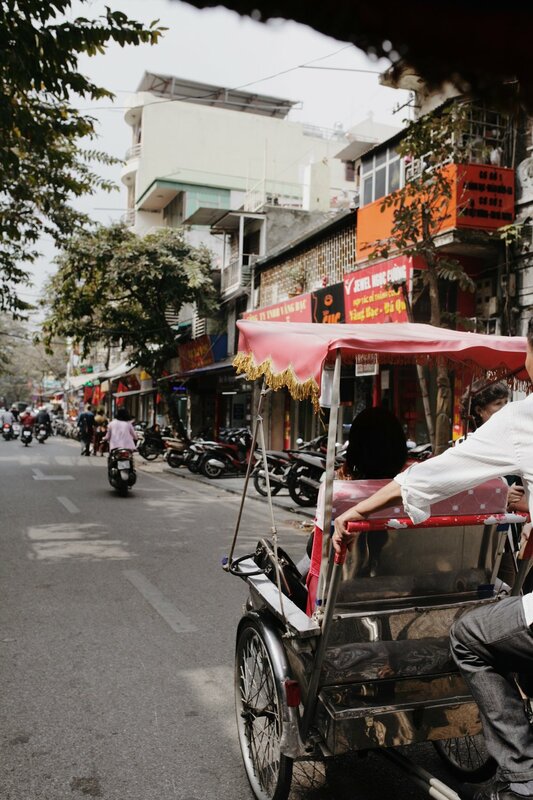 We decided to hop in a tuk tuk (a pedaled rickshaw and very common mode of transportation) that took us across the city to the Ho Chi Minh Mausoleum, the final resting place of the Vietnamese Revolutionary leader. We also saw One Pillar Pagoda, a historic Buddhist temple. Then, we found a really cool floating coffee shop on a boat where we sat with a coffee, taking in the sights and sounds. Then it was back to the Old Quarter to grab dinner and a local beer. Our overnight bags were packed and we met our bus driver bright and early in the hotel lobby. We boarded the coach and were off to Ha Long Bay! It was about a four hour drive over to the coast during which our awesome tour guide intermittently stood and filled us in about our surroundings, cultural Vietnamese traditions, language, thoughts on history and modern times, and more. When we arrived at the bay, we boarded a small boat that took us out to our overnight boat. Our cabin window looked directly out toward the bay and the awe-inspiring views were limitless. We were fed local meals, taught how to make traditional foods, socialized with other travelers on the rooftop deck, and went on an off-boat adventure into the enormous Hang Sung Sot cave. We were constantly, slowly moving throughout Ha Long Bay's 600 square miles. I had seen many photos of this place before visiting, but never dreamed it was so huge! It is filled with tall limestone islands (about 2000 of them) that have rainforests on top - so dreamy. If you have a chance to visit this magical place, I highly encourage it. It was mentioned that they may not be able to offer overnight boat tours after the next couple of years due to tourism monopolization in the area. 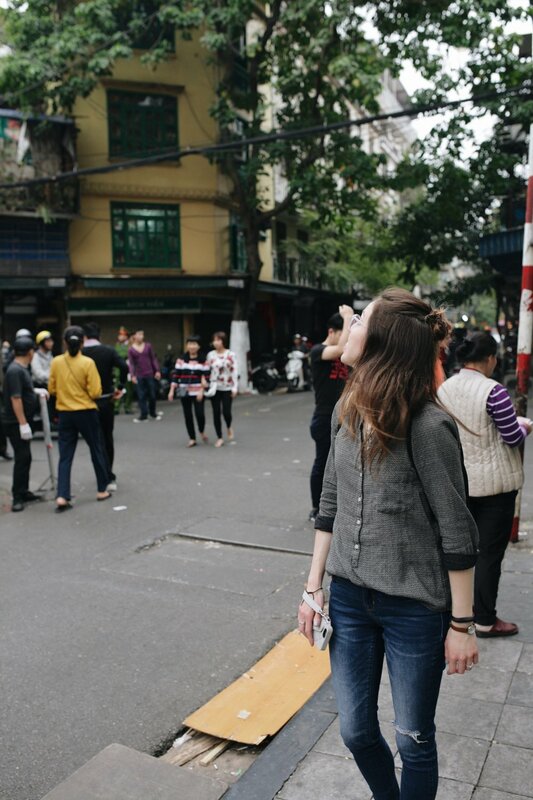 On the afternoon of our second day there, we boarded the coach once again and headed back to Hanoi. We woke up back in our original hotel ready to board another tour bus. We were again met by an outgoing, informative guide who gave us more history lessons along the way. We arrived in the Ninh Binh province and I was once again astonished by the scenery. 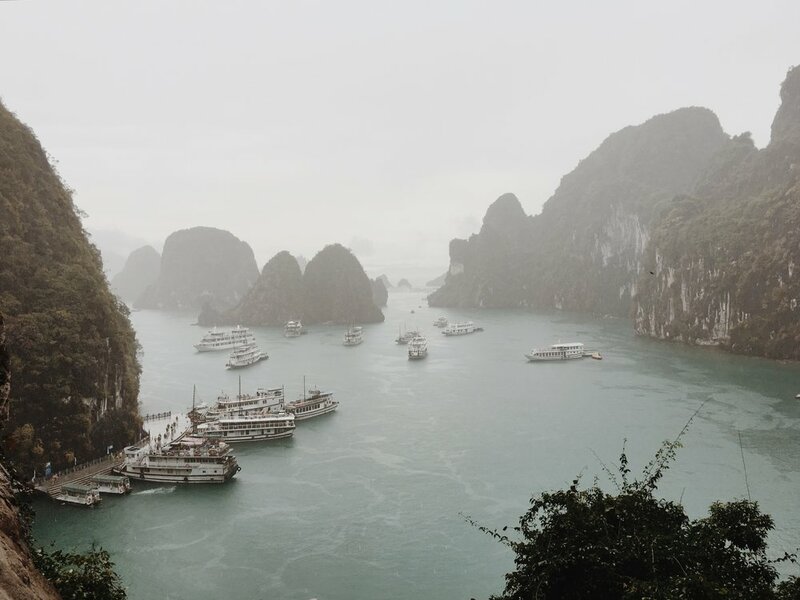 This area is known as "Ha Long Bay on land" and it is clear why. We were surrounded by more mountains, this time towering above expansive rice fields instead of water. Our first stop was to visit two ancient temples in Hoa Lu. We learned the differences between temples and pagodas: temples are for worshipping kings and pagodas are for worshipping Buddha. You must take your shoes off in pagodas because, if not, your feet will clomp and you might be reincarnated as a horse or goat. 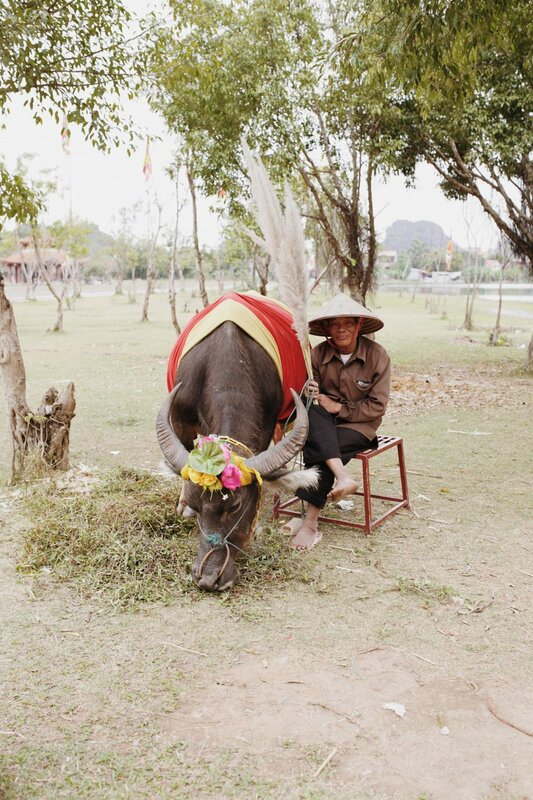 Men are in charge of taking care of temples and women of pagodas. People bring gifts of vegetarian food to Buddha but all foods and alcohol to kings. There are thresholds you must step over when entering temples that cause you to look down as you step in - a naturally forced bow of respect. I learned all of this from our wise guide. 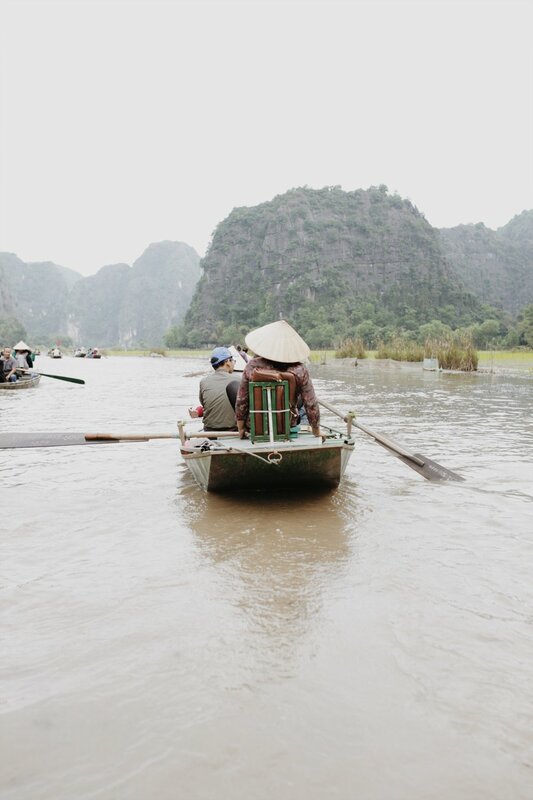 We then made our way to the river in Tam Coc where we boarded boats paddled by locals and were brought down the winding river and back, a wonderfully unique way of seeing the sights. After our boat tour, we mounted bicycles and were led on a guided tour along bumpy dirt roads through the rice fields. It was another superb day of learning and observing Vietnamese culture and nature. We spent one last night back in our hotel before our flight to Thailand early the next morning. On most of my travels, I tend to be my own guide. However, I am so thankful that we decided to take multiple guided group tours while in Vietnam, as I was able to learn so much history and culture that I otherwise probably would not have. As you can see, we were able to fit so much into our few days in Northern Vietnam. If anyone ever tries to discourage you from a short trip, don't listen! You, of course, will not be able to see it all (I know I have to go back to see Sapa, Hoi An, and much more), but a sizable taste can be gained from a short visit. Now I know that I must return! Have you dreamed of visiting Vietnam? If you created your own Southeast Asia itinerary, what would you include?